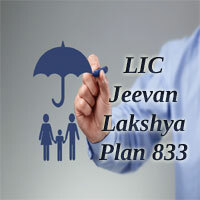 LIC Jeevan Lakshya Plan (Table No. 833) was introduced by the Life Insurance Corporation on 12th March 2015, as per the new IRDA guidelines. Jeevan Lakshya Plan was a limited premium paying standard With-Profits Endowment Assurance plan. In this LIC Plan No. 833, the premium paying term is less than the policy term by three years. The Jeevan Lakshya Policy provides Annual Income Benefit to fulfill the needs of the family members mainly for the benefit of children, in the case of inappropriate demise of the insured during the policy term. LIC Jeevan Lakshya Policy is a participating Non-linked policy that provides dual benefits of Investment and life cover. It also provides a lump sum amount at the time of maturity regardless of survival of the insured. The unique identification number (UIN) for this plan is 512N297V01. This UIN should be used in all relevant documents provided to the policyholders. What are the Features of LIC Plan No. 833? Payment of premiums is limited to a term shorter than the policy term. Endowment plans with guaranteed returns. The optional cover will be available through two additional riders. Offers fixed amount every year as an Annual income benefit. On Maturity or death, Sum assured + Simple Reversionary Bonus + Final Bonus would be paid. In the case of death of the policyholder, 10% of Sum Assured will be given to nominee until the end of the policy term. Yearly, Half Yearly & Quarterly -Within 30 days. On the death of the insured during the policy term, Death Benefit = “Sum Assured on Death” + vested Simple Reversionary Bonuses + Final Additional Bonus (FAB), if any. Annual Income Benefit = 10% of the Basic SA, which shall be payable from the policy anniversary coinciding with or following the date of death of Life Assured, till the policy anniversary before the maturity date. Assured Absolute Amount = 110% of Basic SA, which shall be payable on the due date of maturity. The vested Simple Reversionary Bonuses and FAB, if any, included in the Death Benefit, shall be payable on the due date of maturity. The Death Benefit shall not be less than 105% of all the premiums paid as on date of mortality. Maturity Benefits Payable = Sum Assured on Maturity + Vested Simple Revisionary bonuses + Final Additional bonus. Sum Assured on Maturity is the Basic Sum Assured. A Grace Period of not less than 30 days will be allowed for the payment of rider premium in yearly, half-yearly or quarterly modes. For monthly rider premiums, the grace period is within 15 days. If the Policyholder was not satisfied with the Terms and Conditions, he/ she might return the policy to the corporation within 15 days. The count should be from the date of receipt of the plan. LIC’s Accidental Death & Disability Benefit Rider. LIC’s New Term Assurance Rider. LIC’s Accidental Death and Disability Benefit Rider (AD & DB) is an optional rider that can opt for at any time within the premium paying term. The UIN for this rider is 512B209V01. The benefits covered under this rider shall be available during the policy term. The premium shall be paid during the premium paying term of the Basic plan. If this benefit is opted for on death due to an accident, an additional amount equal to the Accident Benefit Sum assured will be payable provided that the rider is inforce at the time of the accident. In the case of Accidental permanent disability, the amount equal to Accident Benefit Sum Assured shall be paid in equal monthly installments spread over ten years and all Future premiums which are equal to Accident Benefit Sum Assured will be waived off. 5. Maximum Accident Benefit Sum Assured Equal to Basic Sum Assured subject to the maximum of Rs.100 lakh overall limit. The Accident Benefit Sum Assured shall be in the multiples of Rs. 10,000 only. LIC New Term Assurance Rider plan can be attached to a basic policy to provide add-on benefit at a nominal cost. It should be attached only to the Non-Linked plans at the inception of the base policy. If this LIC New Term Assurance Rider is opted for on the death of the life assured during the policy term, an additional amount equal to Term Assurance Rider SA will be paid provided that the rider cover is inforce. The UIN for this rider is 512B210V01. LIC Jeevan Lakshya Premium Calculator is used to calculate the premium amount in Yearly, Half Yearly, Quarterly, and Monthly modes. Through LIC Jeevan Lakshya Maturity Calculator, you can calculate the LIC Lakshya Jeevan Premium amount that has to be paid to get all the benefits available under this policy. The data required for calculating premium rates using Jeevan Lakshya Calculator are Name, Email-Id, Age, Term, Sum Assured, etc. The Buying process of LIC Jeevan Lakshya policy is very simple if you have all the information regarding documents with you. Life Assured can buy the LIC Plan 833 either in online or offline mode. In online mode, visit the direct website and fill the application or proposal form. In Offline mode, Insurers have to approach the LIC agents and pay the premium by Cash/ Cheque/ Demand Draft. The Claimant should submit the following documents while lodging the claim in case of death of the Life Assured. Loan Facility: Loan facility is available under this policy after payment of premiums for at least three years. The maximum loan issued will be the percentage of surrender value. However, the percentages will vary from time to time. The rate of interest for the loan amount would be determined by the corporation. Paid-up Value: If the insured stops paying the premium, After three years policy will acquire some value and it will be canceled. Surrender Value: If the premiums have been paid at least three full years, the policy can be surrendered at any time during the policy term. Guaranteed Surrendered Value: Some % of ( Total premiums paid (net of taxes) – any extra premiums – premiums for riders). + surrender value of Bonus.This percentage will depend on the term of the policy and the year we want to surrender the policy. Special Surrendered Value: LIC will pay Special Surrender Value if Guaranteed Surrender Value is less than Special Surrender value. Policy Revival: If the policy lapsed, it might be revived within a period of two successive years. The renewal of riders will only be considered along with the revival of the Basic policy. Back-Dating Interest: The policies can be dated back to the same financial year. The period upto 14 days is to be ignored and 15 days or more is to be rounded to a month for this calculation. Proposal Forms: Proposal Form no. 300 issued by the U&R Department as applicable should be used for this LIC Jeevan Lakshya plan. Policy Stamping: 20 paise per thousand of Sum assured will be the Charges for policy stamping under this plan. Assignments/ Nominations: Assignments or Nominations for Plan 833 should be made at the proposal stage as per Section 39 of Insurance Act, 1938. Suicide Clause: The Policy will become void if the life assured commits suicide within 12 months from the date of commencement of risk or the date of revival. An amount equal to 80% of single premium shall be paid excluding any taxes and extra premium. 1. What is Jeevan Lakhsya Plan? A. Jeevan Lakhsya Plan is one of the endowment plans of LIC in which if the insured dies while the policy is in force his/her nominee will receive regular payment and if the policyholder survives after the expiry of the policy, insured will receive a lump sum which includes the Bonus. 2. What happens if you stop paying the Premium? A. The Policy will lapse if you have stopped paying the premium within the grace period.